Amaranth’s origin is South America, Central America, and Mexico. Hunter-gatherers likely collected and ate the seeds since pre-historic times, and evidence indicates that its domestication occurred as far back as 4,000 or 5,000 BC. Earliest remnants of the plant were seeds discovered in Mexico’s Tehuacan valley. The Aztecs revered the plant, believing amaranth to be a source of strength. Royalty feasted on the grain, and it was a common feature of religious practices… human sacrifices included. Regrettably, the Spanish conquistadors misinterpreted some of the Aztec’s earliest uses of amaranth. According to the book, “Encyclopedia of American Indian Contributions to the World,” it was common to consume amaranth tamales as part of worship. Seeing this, the Spanish assumed such practice was mocking the communion of Christ and, as punishment, ordered the destruction of all amaranth crops. 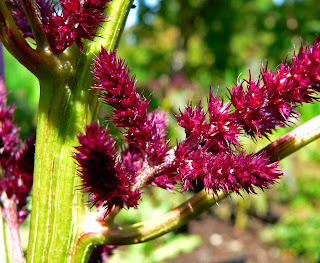 Growing, selling, and distributing the plant was punishable by chopping off the hand, and thus came its reputation as being a “lost crop.” Though amaranth cultivation declined substantially over the next hundreds of years, it still continued up north in Central America and Mexico. When and how amaranth arrived to Asia is a mystery. Indeed, many types of amaranth became indigenous to various regions around the world long ago. One theory is that the plant arrived to India roughly 500 years ago, where it came by way of established trade routes through Africa. Perhaps it came to China first—medical records dating from 750 AD allegedly describe 4 different types of amaranth. J.D. Sauer’s book, “Evolution of Crop Plants” states that pale-seeded amaranth was cultivated throughout India and Sri Lanka in the 1700s: At least three types of amaranth originate in Asia, including A. blitum, A. spinosus, and A. tricolor. Today, the plant is a staple for many groups in India—in the hills of Northwestern India, for example, up to half of the region’s non-irrigated land is dedicated to amaranth’s growth. It’s also common in Nepal, Tibet, and Afghanistan. While many parts of the world laud amaranth grain as a superfood, using the leaves as a culinary practice remains unique to parts of Asia. And yet, the greens so ubiquitous in India may overthrow kale as the new green star of the West. The Himalayas houses the greatest variety of amaranth. However, its adaptability permits it to grow in a range of climates, from the high elevations of the north to the hot, humid conditions of the south. Amaranth is short-lived, but parts of the plant are available year-round. Many varieties of amaranth leaves sell in produce markets large and small. Amaranthus caudatus: Known as “love lies bleeding” for its red, beautiful overhanging inflorescences. 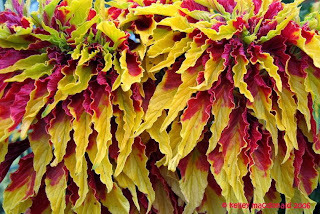 Amaranthus cruentus: A green variety that occasionally appears in beautiful shades of purple, red, ginger, or cinnamon. Amaranthus hypochondriacus: Usually ornamental, this variety known as “Prince of Wales Feather” has tall, thin, spiky inflorescences. Though this type originates in Mexico, it’s seen throughout the Himalayas. Amaranthus paniculatus: Also called “Autumn palette,” named as such for its gorgeous colors of gold, rust, and delicate orange. Amaranthus tricolor: Named as such because of its tricolor leaves in flaming yellows, greens, and reds. Amaranthus vridis: called “green amaranth” and “slender amaranth.” It’s one of the most common varieties sold in the country. The small, young amaranth leaves taste mellow with a hint of sweetness, and possesses a tender texture. They are often substituted in recipes calling for spinach. The grown leaves, on the other hand, are much tougher and bitter. To reduce their astringency, mature leaves are often boiled, steamed or sautéed. As indicated by the nutritional profile above, amaranth is an excellent source of calcium, magnesium, potassium, vitamin C, vitamin B6, folate, vitamin A, and an incredible source of vitamin K.
--Amaranth leaves, rich in calcium and beta-carotene, keep bones strong and reduces one’s risk of osteoporosis. Its calcium content also assists with muscle regeneration and stabilizes blood pressure. --Its high vitamin C content helps the body produce collagen, which aids in joint health and keeps skin looking beautiful. 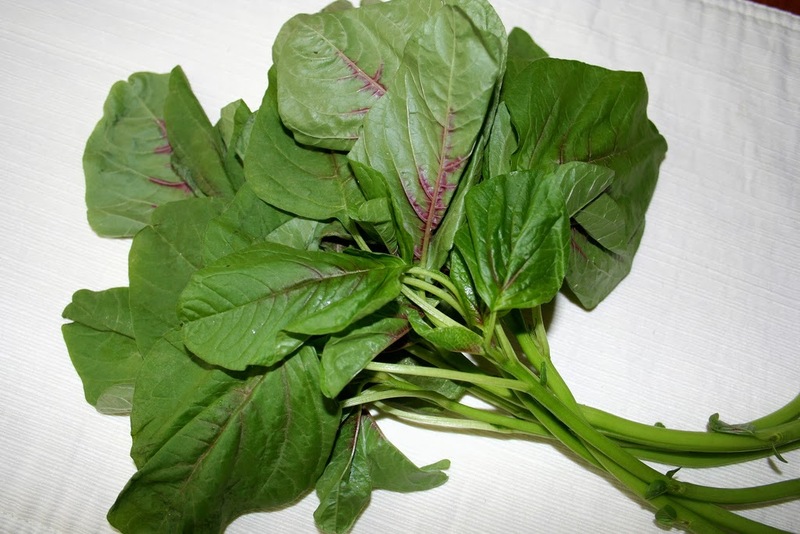 --The folate in amaranth leaves decreases cardiovascular damage, and also keeps the memory strong. --The Center for Science in the Public Interest affirms that the nutrient density of leafy greens, complete with vitamins, minerals, and phytonutrients, reduces the risk of colon cancer, stroke, and offers the most nutrition per calorie than most other foods. Amaranth features in many traditional remedies. According to the book, “Diet and Health through Ayurveda,” amaranth greens acts as a coolant, digestive, and stimulant. It also boosts vision, fights respiratory ailments, colds, stunted growth, and aids reproduction. Additional benefits include combatting anemia, stomach ailments, and fever. 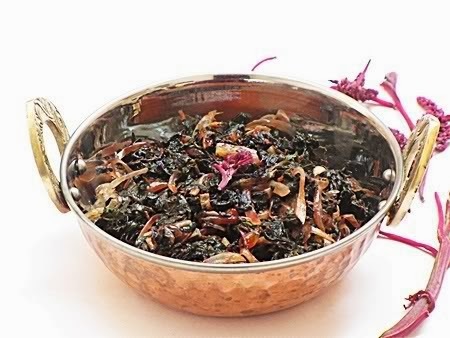 Many groups drink boiled amaranth leaf water to soothe inflammation and sore throats. This tea also treats acne, and in the Philippines, a topically applied poultice from the bruised leaves treat edema. *Note: amaranth, like many greens, is high in oxalic acid. This compound binds with calcium and thus limits its absorption. Additionally, buy organic leaves when possible—the plant has a tendency to accumulate nitrates, and nitrate-based fertilizers exacerbate this issue. Choose tender, young amaranth for salads and gentle heating. Otherwise, select larger, mature leaves for use in stir fries, soups, and roasts. Look for bright, robust leaves with no obvious signs of wilt, dryness, browning, or floppiness. Prepare amaranth by washing, shaking the leaves, and then pat drying. The stems are edible, and may be included with any dish. --To get acquainted with the taste of amaranth, start with a simple steaming: Heat no more than a tablespoon of oil, and then add chopped or pre-roasted garlic. Throw in amaranth leaves, salt, and a tablespoon or two of water. Let the leaves steam for a minute, toss, and then cover for another minute. Serve warm. 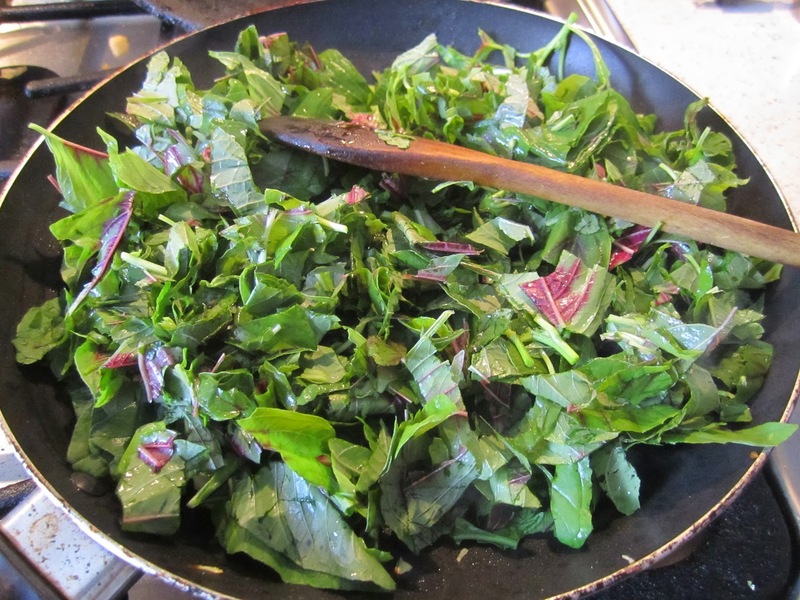 --Like agathi, one of the most common amaranth leaf recipes is a simple green stirfry: chop the leaves until they are fine and confetti-like. In a pan, heat oil, mustard seeds, curry leaves, and less than a handful of dal. Once the mustard seeds pop, stir in garlic and onion until translucent. Add the greens, cover, reduce the heat, and let sit until the leaves are withered. Mix in coconut if desired. Add the stir-fried leaves into dals or soups. --Chef Colby Lieberman came up with amaranth leaf pesto, made by blending leaves in a food processor with garlic, olive oil, vegetable stock, cayenne pepper and salt. Spread on sandwiches or pizza, mix as part of a salad dressing, or eat like a dip. Or, add to stuffed mushrooms. --Toss pasta in a sauce made from minced garlic, fresh chopped leaves, salt, and olive oil. Cheese is optional. --Mix the young fresh leaves with a salad dressing made with mustard, cumin, balsamic vinegar, rice vinegar, and honey. 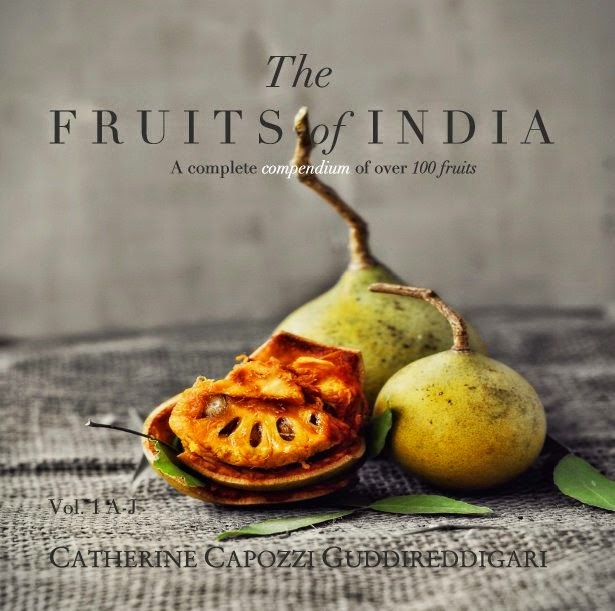 Pair with raisin, mango, pistachio, and pomegranate. --In the month of Shravan—celebrated to honor Shiva swallowing poison during the churning of the oceans—it’s common to serve sautéed red amaranth greens with grated coconut. In 2008, a Hindu man living in Queens claims that eating from a Ganesha-shaped amaranth plant cured his back pain. Each amaranth plant produces 40,000 to 60,000 tiny seeds. A pound of amaranth, then, may contain 750,000 seeds. Of the 60-70 types of amaranth grown in the world, several grow in India. The most ubiquitous are Amaranthus cruentus, Amaranthus hypochondriacus, Amaranthus caudatus, Amaranthus tricolor, Amaranthus paniculatus, Amaranthus tristis, Amaranthus viridis, Amaranthus spinosus, amaranthus paniculatus. 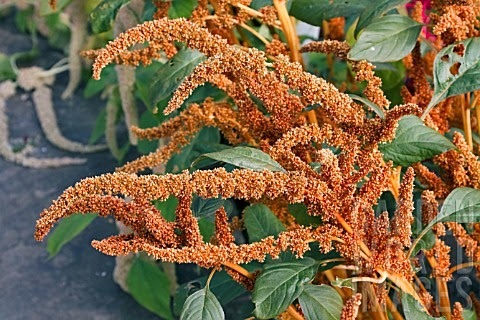 The Hindi name for amaranth, ramdana, means “God’s own grain.” Its other name, rajgeera, means “the king’s grain.” Interestingly, many societies believed the grain to be heaven-sent: these include the Pueblo Indians, the Mayans, Aztecs, the Greeks, and Romans.